Before jumping in, we should define what “succession planting” means. Succession planting is any method or combination of methods that increases the availability of crop plants in your garden throughout a particular growing season(s). Simply put: succession planting helps you get more food from less space over a longer period of time. Hey, that sounds like a good idea! Each season offers different succession planting opportunities. Here’s a spring succession showing a young transplanted tomato plant growing out of an understory of lettuce. As the weather warms, the tomato plant will provide shade for the heat-sensitive lettuce, thus extending the lettuce growing season. Also, by densely sowing the lettuce seeds, we can thin out/harvest smaller lettuce plants to eat as “baby greens,” leaving the most robust plants to reach full maturity. This strategy provides continual harvests from the same spot, rather than long waiting periods for one type of harvest. If you’re looking for one perfect succession planting formula to follow, we’ve got some good news and some bad news… The bad news is there’s no single right way to do succession planting. The good news is you can confidently experiment since there is no “wrong” formula. The strategies you employ can vary depending on the season, the types of plants you enjoy eating, your climate zone, and a host of other factors. And with some basic plant knowledge, planning, and experience, you can get really good at succession planting. A summer to fall succession. Peppers are still ripening overhead as young direct-sown arugula and kale sprout underneath. The pepper plants provide shade, helping to keep the young fall seedlings in the lower temperature ranges that they prefer. 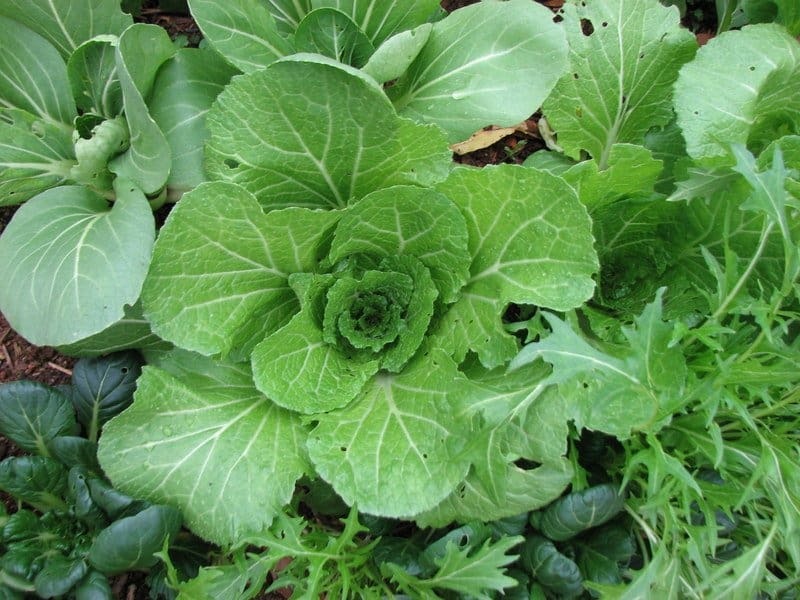 Baby greens will be thinned out for salads, leaving the more robust plants to reach maturity. Under this scenario, not a single week passes without this bed providing a harvest. 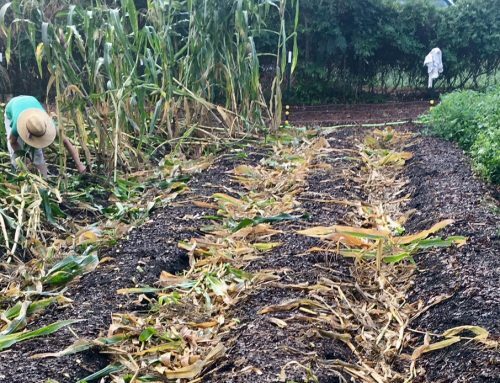 Since it’s November, we’re going to provide some fall/winter succession planting tips that we’ve used successfully in our moderate climate in Ag Zone 7b, just outside of Greenville, South Carolina. Please steal any ideas we have here, improve on them, and also get creative and try your own! One of the keys to a good succession planting plan is considering how you’ll harvest a particular plant. Some plants will provide multiple harvests (“cut and come again”) over the growing season and some will just provide a single harvest (“one and done”). Some plants can fall in either category (“versatile veggies”). Young lettuce (front), kale (middle), and spinach (back), can all be used as “cut and come again” veggies. You can sow their seeds densely and remove whole young plants as baby greens to make more room for the more robust plants to continue growing to full maturity. Then harvest the outer leaves on the mature plants as-needed. Not a day passes when you can’t pick a nice mixed green salad from a garden bed like this. This beautiful bok choy is ready to harvest whole, but the young arugula on the left and the tiny mâche seedlings sprouting around it will have plenty of greens to offer as fall continues. As mentioned above, bok choy could also be considered a “versatile veggie” (see next section) since you don’t necessarily have to harvest the whole plant at once. Broccoli – Depending on the variety, many broccoli plants will actually continue forming lots of smaller florets after you’ve harvested the main floret head, not to mention the leaves can be eaten like kale. Celery – Celery you buy at the grocery store has been harvested as a “one and done” plant, but you can harvest celery stalks as you need them from the outside of the plant, leaving the plant in the ground to continue growing. Chicory – There are lots of wonderful varieties of chicory. Some can be harvested as individual leaves over many months (ex. leaf chicory) and some are bred to be harvested as a single head (ex. Belgian endives). Lettuce – You can harvest enough outside leaves from the heads of a few lettuce plants for a salad without harvesting the whole head, or you can let it mature to harvest as a large, single head. And if you cut the head about an inch above the ground, a new smaller lettuce head will form from the side of the stalk. A beautiful head of heirloom lettuce at full maturity. We started by direct-sowing lots of lettuce seeds into a small area, and thinned out the smaller plants over 4-6 weeks, leaving the most robust lettuce plants to reach maturity. You’d be waiting for a while to get a harvest since most Brussels sprout varieties take 90+ days to reach maturity. You wouldn’t have anything to eat from your garden while you were waiting. Once you got a harvest, you’d be done and have to start over again. What if instead you planted multiple plant species together (polyculture), with some varieties that you could start harvesting within a few weeks, some varieties that would give you continual harvests for several months, and others that would give you one big delicious harvest all at once? You’d eliminate problems 1, 2, and 3 listed above. And your soil microbes would be happier too. Young mixed heirloom lettuce varieties in the front, kale in the middle, Austrian winter peas (which produce delicious pea-flavored shoots used as a salad green) starting up a trellis in the back. So, start your fall/winter garden succession planting plans by using the plant lists above to fill your garden beds with “cut and come again,” “one and done,” and/or “versatile” plants. 1. Direct Sow or Transplant or Both? Direct sowing your seeds in the garden is quite easy. Some seeds actually have to be direct sown since they’re sensitive to root disturbance/transplant shock (carrots, parsnips, beets, etc). The downside to direct sowing for other seeds is you might not get optimal germination due to temperature and moisture fluctuations. Plus, it makes it a little harder to get a jump start on the season. 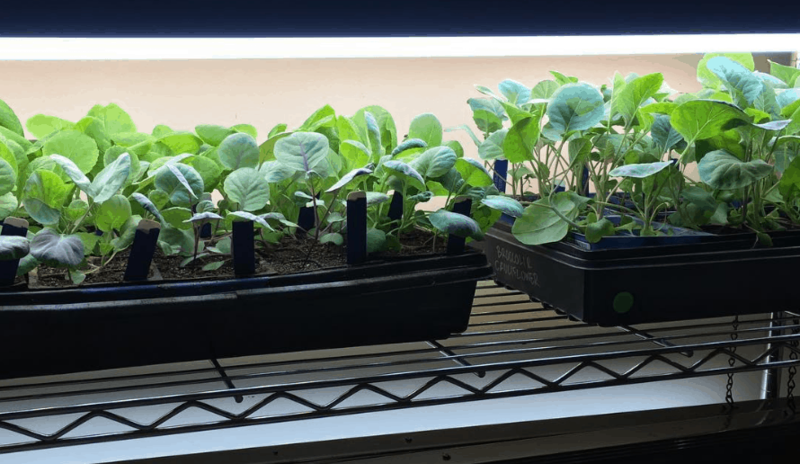 Starting your seeds indoors is a little more time and knowledge-intensive, and is best done if you have grow lights (here’s our setup) or a really sunny south-facing window to ensure your plants get enough direct light and don’t get leggy. Personally, we like to do both direct sowing and transplanting. Transplanting allows us to start some of our fall seeds in late summer, far earlier than we’d be able to if we were direct sowing them all. The same is true when we start our tomatoes, peppers, and eggplants indoors in Feb-March before transplanting them out after our last frost date in April. 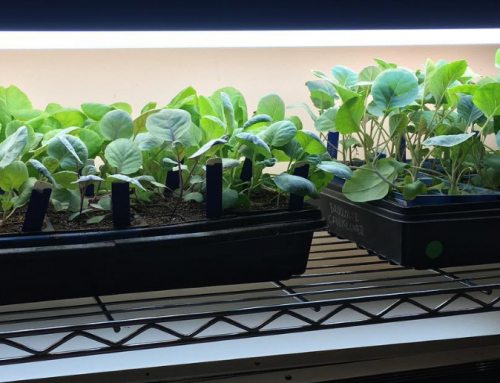 It’s late summer in this photo, but we like to start many of our seedlings indoors to give them a 6 week jump on the season. This is especially helpful for longer-maturing fall seedlings (like cabbage and Brussels sprouts) that you might not have time to direct sow outdoors and get a harvest from before extreme cold weather sets in. This means immediately putting in new seeds once you pull a fast maturing plant. 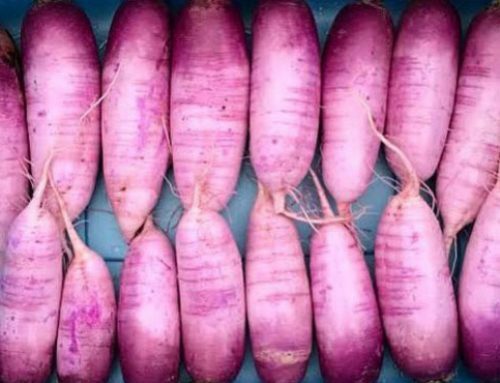 For instance, radishes can reach maturity very quickly, in as little as a few weeks, so you can grow a huge number of radishes back to back in the same spot in the cool months. The best way to ensure a continuous harvest of high quality radishes is to plant 15 per square foot every 5-14 days. Sow them a bit more deeply in order to obtain larger roots — radishes will poke their shoulders above the soil as they grow (which makes it easy to tell when they’re big enough to pick). They will grow even longer roots if the seeds are planted an inch deep instead of the more common recommendation of ¼ inch deep. Every seed variety is different, so check the “days to maturity” on your seed packet. This simply means how many days you should expect it to take between sowing the seed and harvesting the plant. You’ll also notice that, where applicable, GrowJourney seed packets tell you days until “baby greens” can be harvested, as well as days until full maturity. 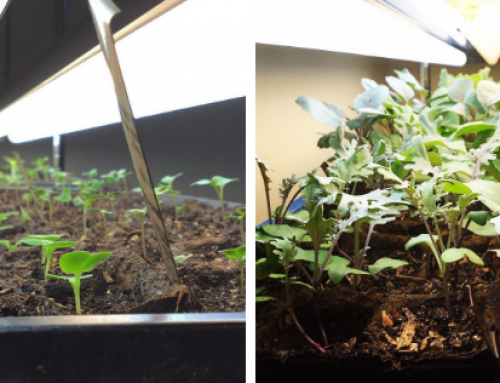 For leafy greens like kale and arugula, we like to sow them densely, then “thin out” the least vigorous plants to eat as baby greens for salad 3-4 weeks after sowing. We leave the most robust plants to reach full maturity. Related to “days to maturity,” are seasonal and zone considerations. If you live in Maine, and you put cabbage seeds (which take 80+ days to mature) in the ground in November, you’re not going to have much success unless you have a heated greenhouse, polytunnels/lowtunnels, or cold frames. Also, even though you can grow the same varieties of garden veggies in the fall and spring (or winter in warmer zones), factor in that it will take longer for your plants to reach maturity in the fall than in the spring. Why? The days are getting shorter and colder, not longer and warmer. Brrr! It’s freezing out, but that doesn’t bother the dense pile of delicious chickweed, spinach, and claytonia growing under our low tunnels/polytunnels. 5. To Cover Or Not To Cover? If you live in Zones 8 or warmer, there’s a good chance you can garden straight through the winter without covering your plants. If the temps happen to drop into the 20s, you can just put old sheets or blankets over your more cold-sensitive plants. However, gardeners in colder climate zones will benefit from growing more cold-sensitive plants under a polytunnel/lowtunnel or inside a cold frame. Any time it rains or daytime temperatures are over 55°F, uncover the plants so that they don’t get too hot, which will stress them. Low tunnels/polytunnels on beds in our back garden. To keep cool weather plants growing at optimal rates, we’ll put the cover up when temps drop below 40. When temps are over 55, we’ll pull the cover off so the plants don’t get too hot, causing them to bolt (bolt means produce flowers and seeds). The temperatures on this cool winter day were in the 50s, so we removed the cover on this bed. Final Note: Should You Let Your Soil Rest? We’d like to dispel a certain myth that got started back before agronomists knew anything about the soil food web: no, your soil should NOT “rest,” e.g. be left fallow. Ever. In nature, soil without roots in it is either in a temporarily disrupted state or it’s called a desert (and you’re not trying to grow a desert). using compost/worm castings 1-2 times per year to make sure you have a good mix of symbiont and predatory microorganisms in your soil. Put 1-2″ of compost on the soil surface before you top-dress with wood chips OR make an actively aerated compost tea soil drench if you already have a thick layer of mulch on the surface. Don’t have any homemade compost or worm castings? Thankfully, you can buy really good ones here. A multi-functional daikon radish. The roots make wonderful veggies, as do the edible greens, flowers, and young seed pods. They’re also a valued cover crop used to improve soil quality. Leave them in the ground to rot in the spring rather than harvesting them to break up clay soil and/or add lots of soil fertility for your spring/summer crops. We hope this article was helpful! If you have any questions, please ask them in the comments section.